As you might know, ACL injuries can take anywhere from six to nine to sometimes even twelves months of rehabilitation before an athlete may find herself back on the field. Sustaining an ACL injury is not only a physical, but an emotional blow where an athlete’s entire world is flipped upside down. After hearing those three dreaded letters, the reality of the better part of the next year sets in… and it stinks. By my fourth ACL, I really couldn’t wrap my head around enduring rehabilitation again. I remember waiting in pre-op staring at my heart rate jump on the monitors and watching the saline drip into my IV. I distinctly remember the feeling of dread that grew more and more with each second that ticked down towards my surgery time. My only comfort laid in the fact that I knew exactly what would happen next. I’d been in this situation multiple times before. I knew I would wake up in the recovery room, my leg would be completely numb, and my knee would already be braced up. As a 4x member of the ACL club and now orthopedic physical therapist, I also knew exactly what the next few months had in store for me. Today’s post will focus on those first four weeks after waking up in the recovery room. Maybe this post applies to you, or perhaps you know someone who is about to go through the process. Knowing “what comes next” can be extremely helpful when it comes to calming those nerves, so please feel free to hit the share button (teamwork really does make the dream work, afterall). It’s important to realize that everyone’s rehabilitation will be slightly different. Different surgeons advocate for different approaches and different post-operative protocols. Some may require you wear a knee immobilizer up to 6-weeks post-op, while others may not even brace you whatsoever. Rehab will change slightly if other ligaments, bony, or cartilaginous structures of the knee are also repaired, so please remember this is not a “one-size-fits-all” type of situation. There are, however, many fundamental similarities in the rehabilitation of an anterior cruciate ligament, and I will lay them out below. Once you return home from the hospital, it will be imperative to let the knee calm down. I know that we, athletes, like to hit the ground running so-to-speak, but doing too much, too fast can slow down your recovery. Step one is to modulate, or manage, your pain appropriately. Only use medication in consultation with your physician, and remember that getting on a regiment and staying on top of the pain before it escalates, can be a huge game-changer. Ice and cryocuff machines can also be excellent alternatives to the opioid medications frequently prescribed post-operatively. After pain management comes swelling reduction. An ACL reconstruction is a traumatic experience. The knee will inevitably swell up, and you will have a moderate amount of joint effusion. Bruising is also completely normal. Remember to keep your leg elevated and compressed in an ACE wrap bandage. Propping your leg up on a pillow above the level of your heart and performing simple ankle pumps can also help facilitate venous return back to the heart. During this stage of rehab, “quad sets” will become your new best friend. Quadriceps setting is when a patient squeezes the anterior thigh muscles as much as possible to straighten the knee. I often tell my patients to do up to 1,000 per day because the sooner they regain neuromuscular control of their quads, the quicker they can progress through rehab. Many patients encounter a strange phenomenon during this stage, where they cannot physically activate their thigh muscles. Marked weakness of the quadriceps is typically observed following injury, surgery, or pathology affecting the knee joint when significant swelling is present. This is partly due to ongoing neural inhibition that prevents the central nervous system from fully activating the quadriceps, a process known as arthrogenic muscle inhibition, or AMI. If you are having a hard time turning on your quad muscles, don’t panic! A study by Sonnery-Cottet et al. looked at different therapeutic interventions used to treat AMI in post-op ACL patients. After reviewing over 780 studies, 20 of which met inclusion criteria, the found moderate-quality evidence supporting the use of cryotherapy and exercise to decrease AMI. While many physical therapists elect to use Russian Stim or Neuromuscular Electrical Stimulation (NMES) to wake up the quad muscles, these researchers only found low-quality evidence supporting the use of such modalities. So, what does this mean for you? Ice can not only decrease pain, but can also increase muscle activation. So lose the stim pads and pull out the frozen peas! As a clinician, I know that there are a number of positions and techniques that patients tolerate well, as well as a few that patients do not particularly enjoy. Physical therapists will either bend your knee with you laying on your back, laying on your belly, or sitting at the edge of a table. As a former patient, I can say that the seated position is usually the most comfortable when ranging the knee. Sitting at the edge of the table allows gravity to gently distract the tibia (shin bone) from the femur (thigh bone), providing a transient sense of pain-relief. Furthermore, having a patient lay on her back or belly can also make her feel uncomfortable, as the therapist towers above cranking her knee into flexion. The tibia can also sag posteriorly in these positions, resulting in impingement-like anterior knee pain. That’s no bueno. Many physical therapists aim to hit approximately 90 degrees of flexion by the end of the first week, with full range of motion (125+ degrees) achieved by week four to six. Once a patient is weight-bearing, she can start to perform other exercises that reinforce knee flexion like mini squats or eventually lunges. Sonnery-Cottet B, Saithna A, Quelard B, et al. Arthrogenic muscle inhibition after ACL reconstruction: a scoping review of the efficacy of interventions. Br J Sports Med. Published Online First: 07 September 2018. Lowe WR, Warth RJ, Davis EP, Bailey L. Functional bracing after anterior cruciate ligament reconstruction: A systematic review. J Am Acad Orthop Surg. 2017;25:239–49. Kruse LM, et al. Rehabilitation after anterior cruciate ligament reconstruction: a systematic review. J Bone Joint Surg Am. 2012 Oct 3;94(19):1737-48. Wright RW, et al. Bracing after ACL reconstruction: a systematic review. Clin Orthop Relat Res. 2007 Feb;455:162-8.
Cooper R, Hughes M. Melbourne ACL rehabilitation guide. https://www.premax.co/us/all/acl-rehab-protocol. Published 2018. 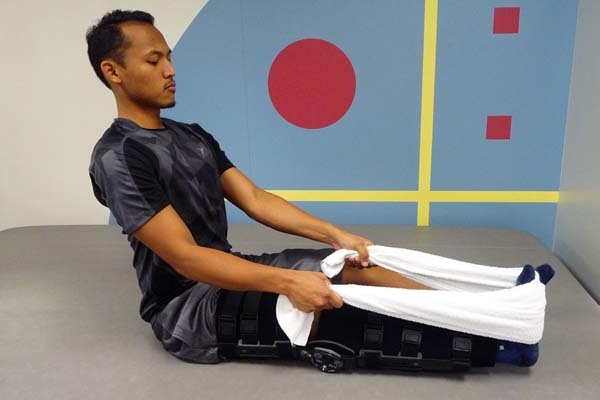 Macrina L. Three ways to avoid loss of motion after ACL reconstruction. https://championptandperformance.com/3-ways-avoid-loss-motion-acl-reconstruction/. Published October 2014. I have been wondering how it would be after, I like the way you describe and talk about it and not only that also very informative. Keep this posts coming please! It’s me know when you publish a book I will definitely buy it.